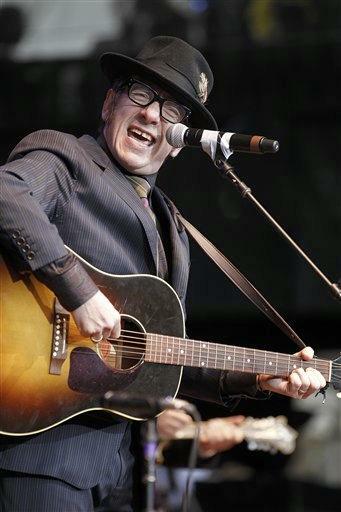 NEW YORK (AP) - Elvis Costello is dusting off his "Spectacular Spinning Songbook" for a concert tour this spring. The device, a huge game show-like wheel filled with the names of 40 songs, is spun by invited audience members to help select part of the concert playlist that Costello and his band, the Imposters, will perform. Costello used it on a mid-1980s concert tour. It was filled with a combination of well-known songs like "Alison," a handful of obscurities and covers like Prince's "Sign O' the Times." He's put out about a dozen albums since then. Selected audience members will also be invited to the onstage "Society Lounge," where light refreshments will be served. The "Revolver" tour starts May 7 in Reno, Nev., and hits seven other cities.